Our beloved teacher and mentor; the best man to walk this earth, Prophet Muhammad (peace and blessings be upon him) said that no one has ever been given anything more excellent and more comprehensive than Sabr. So what is Sabr you may ask? Well, Sabr is an Arabic term that is often translated as ‘patience’, ‘perseverance’, or ‘steadfastness’, and in actuality encompasses all three characteristics. It is a fundamental aspect of Islam and has been mentioned in the Qur’an over ninety times! Sabr is one of the most beautiful characteristics that a believer can possess. It raises and elevates one’s rank in the eyes of God Almighty and is a quality often attributed to those most beloved to God Almighty. Sabr has two meanings to it, the first and more common one is to have patience and perseverance when afflicted with calamities or in the face of difficulties, and the second one is to show steadfastness in the religion by avoiding sin in the face of temptations and being persistent in doing good when it is tough. Sounds pretty simple right? Well, when you’re in the middle of life’s greatest trials or at the very brink of sacrificing your religion for your desires, then it’s not as easy as it sounds, and that is when Sabr is most needed and in fact most rewarded as well. Sabr is a quality that we find in the lives of our great role-models, the Prophets of Islam, as each of them was tested and tried in different ways and pushed to the very limit, and yet they held on to their faith in God with steadfastness and firm perseverance. And for their beautiful patience, they will indeed be rewarded a beautiful reward. This means that on a Day when every man and woman is terrified beyond imagination about the Reckoning, and each person is given their record in either their right or left hand, there will be a people who by the mercy of God will be granted their reward without measure; limitless. Reward that is so great that it has not in fact been limited to a specific reward and will be proportionate to the level of perseverance! The people of Sabr. As we see from this verse and many others in the Qur’an, Sabr is greatly rewarding – and for the very reason that Sabr is not an easy quality to have or to attain. It requires determination, willpower, self-restraint, self-discipline, but most importantly, strong faith in God and a deep yearning to seek only His pleasure. And by the supreme wisdom and knowledge of God, Ramadan has also been granted to us as a chance to attain Sabr. Amazingly, we find that fasting is directly linked to Sabr. When we fast during the day, we are exercising patience and perseverance by abstaining from food, drink, and sexual desires, and showing steadfastness when we protect our eyes, ears, minds, tongues, and hands from all sins and through striving to do everything that pleases God Almighty. Ramadan is a training ground for us to practice, develop and nurture Sabr, to draw closer to God and attain His love through this esteemed act of worship, and to prepare us for a life of trials and tests in which victory is only attained by the Saabireen – those who practice Sabr. So, dear brothers and sisters, strive to develop this revered quality during the month of Ramadan. When the fasts seem long and the body feels worn and tired, exercise Sabr and go that extra mile to do more, and the sweet feeling of victory achieved at the end will be more than worth it. We ask God Almighty to grant us a beautiful Sabr during this blessed month and the months to follow, to make us from those who exert Sabr during the most trying times, and to gift us with a victory in this world and the Hereafter. Be patient whilst fasting and seek to be from those who are beloved to God Almighty. 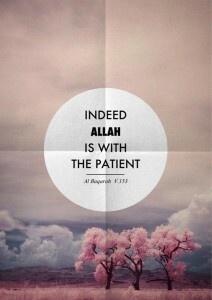 The concepts of Sabr (Patience) and Taqwa (God consciousness) are often mentioned in the Qur’an together. So strive to perfect both this Ramadan! Keep on going. Indeed God Almighty knows what you are going through and He has prepared a reward for you. Never lose hope. During the long fasts and gruelling heat of the summer, many people become irritated and frustrated quickly. Try your best to exercise patience during these times and remember that fasting also encompasses controlling one’s anger and treating others with mercy. Strive to learn more about the concept of Sabr, its rewards and promises, so that you are motivated to attain this quality in your life. Indeed those who exercise Sabr are from the most beloved to God Almighty. So strive to not only encompass this quality in your life in Ramadan, but throughout the rest of the year as well.